1. Soak the skewer sticks in water for about 30 minutes. 2. Preheat the oven on grill setting at 210°C. 3. Mix all ingredients for the marinade and set aside in a large bowl. 4. Drain the tofu and dry, then cut into cubed pieces. 5. Chop the courgettes, peppers and onions. 6. 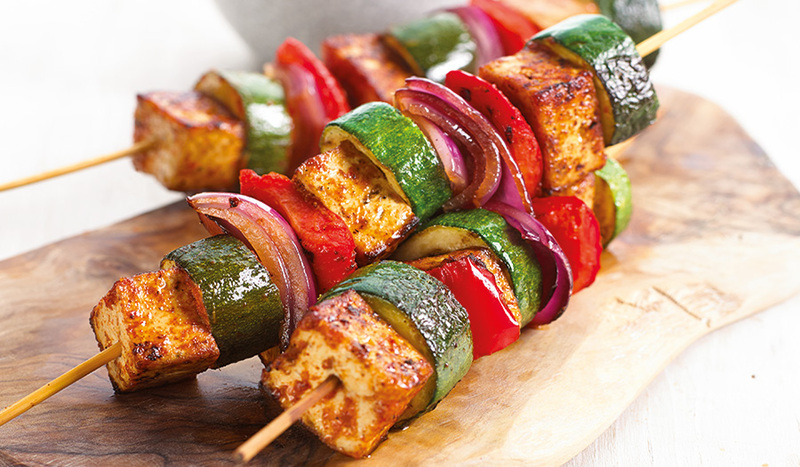 Toss the vegetables and tofu in the marinade and mix gently until well coated. 7. Cover the mix and leave in the fridge for 30 minutes. 8. 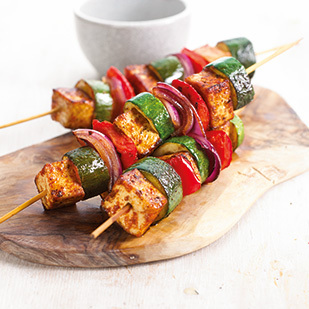 Thread the tofu and vegetables onto the skewer sticks and place them on a baking tray. 9. Grill in the oven for around 25 to 30 minutes, turning occasionally to ensure even cooking. 10. Serve immediately with salad.